HDFC WatchBanking – Imagine how good it is if you can use your wrist watch for doing Banking transactions. Well, your imagination is turned into reality. 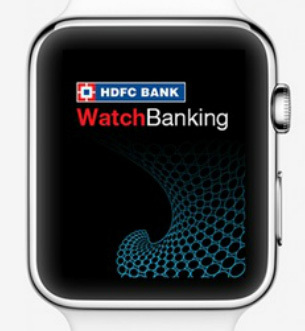 Now you can use HDFC WatchBanking to access all types of banking service through Apple Watch. This facility is launched for the first time in India and it is an exclusive facility for the customer of HDFC bank. Access to all linked bank account at fingertips. Request for Account statements and Cheque book. Get Notification about Discount on Watch. How to use HDFC WatchBanking? Step 1 – Download the latest HDFC Bank MobileBanking app from the App Store or update your app on your iPhone. Step 2 – Pair your apple watch with iPhone. Open HDFC Bank MobileBanking app on your iPhone. Step 3- Follow on screen instruction to set 4 digit WatchBanking PIN. Step 4 – Tap HDFC Bank tab on your Apple Watch enter your 4 digit WatchBanking PIN and get started. HDFC WatchBanking facility is available only on Apple Watch paired with an iPhone 5 and above (using iOS 8.2 and above). HDFC Bank WatchBaking is completely safe as Mobile Banking. This feature can be enabled only after you setup your Customer ID and password. It will work only when your iPhone is closer to your watch. As and when you are closing your watch you need to enter a passcode to unlock it. 4 digit PIN is required in order to access account information. No information is stored on your Apple Watch. As per me, it is a wonderful move by HDFC. Next generation will be of wearable gadgets only. Potential demand of wearable devices are increasing in India. Consumers are keen to welcome wearable devices. A banking facility on personalized wearable device will provide convenience to the customer and also take banking to another level. ICICI is also offering the same type of application called as iWear which is working on both Apple and Android systems. What is your experience with HDFC WatchBanking? Do share your views on above! For more information visit HDFC WatchBanking official web page.